Dramatic title don’t you think? Especially for a film that stars an actor who didn’t live to see it blasted upon the big screen. Poor Bruce Lee, staring in a film that he was no way part of. Now what do I mean by this? Well, galley hoe old-bean, and feast your eyes on this ‘film’ Directed by Robert Clouse; and Starring: Bruce Lee (I think? ), Sammo Hung, James Tien, Colleen Camp and Yuen Biao. It began it’s decent in 1978, and lasted for a grand total of 94 minutes. Hong Kong action star, Billy Lo (Bruce?) has a dilemma plaguing his mind. You see, if he does not comply with the criminal syndicate belonging to Dr. Land, he will then feel the wrath of his evil organisation. Well, so far, they have attacked him twice. Firstly, while he was with his girlfriend, Ann (Colleen Camp), and secondly, while he was visiting his Uncle at the Peaking Opera. Plus funnily enough, Billy has also asked two people what he should do about it too. The first person being his journalist friend, Jim (Gig Young), and the second person being his Peaking Opera star Uncle. Now over time Billy comes to a decision regarding what he should do next -- run -- run likf f*ck. But no. That is the wrong move. Because before he is able to do this, he is shot in the face on a movie set by one of Land’s men. Thankfully, though, Billy is not dead, instead, he hides himself away from 'the syndicate' / he recovers from his injuries / he gets him mate Jim leak out a dummy story about his demise / and he then goes in search for revenge. Initially, Billy does this by tracking down and attacking Land and some of his men in Macau -- which does not work too well for him. Next, Billy kills Land’s top fighter, Karl Miller (Bob Wall), after he wins a boxing championship with Lo Chen (Sammo Hung) -- which does work well for him either. After that, Billy tries to subdue the distraught action of his girlfriend, Karen, with mixed results. And finally, Billy has to prepare himself for what Land has in store for him, when he discovers that Billy is really alive. Still. That's why what next transpires is a right pain in nunchucks I can tell you. As traps are sprung - bikers are done - obstacles are set - and revenge is finally met. No contest – HA-YAI! I find that it is very easy to criticize this film 'Game of Death'. The story is made for TV – most of the ‘Bruce fx’ are laughable at best – and the overall plot is simple and inane. However, what it does try to do, in a round about way, is to instill some of Bruce into this film as well, both visually and story wise - please let me explain what I mean by this. (1) Billy is a Hong Kong actor - as was Bruce. (2) Billy is terrorized by a syndicate - as Bruce was as a child. (3) Billy’s roots are steeped in Peaking Opera - as was Bruce’s. (4) Billy’s love interest is American - ditto for Bruce. (5) Billy wears a number of disguises in this film - as Bruce did in his. (6) Billy seems to have an honorable work ethic - as Bruce had. Now, I probably missed one or two out of this list, but I just remembered a couple of strange facts as well: (1) Billy’s character was shot on a film set, as Bruce’s son, Brandon Lee, was quite a few years later. And (2) The whole ‘conspiracy theory’ that Bruce Lee was alive after his death, is transposed into this film, replacing Bruce with Billy. OK – OK – OK, enough trivia for the time being, what about this film? Well, 'Game of Death' is a basic film with an ambiguous heart. To explain, I have to tell you about the story behind the story first, OK? After ‘Way of the Dragon’, Bruce Lee started devising this film, setting up a basic Hong Kong style revenge plot-line, whilst at the same time trying to convey the philology behind his fighting technique. 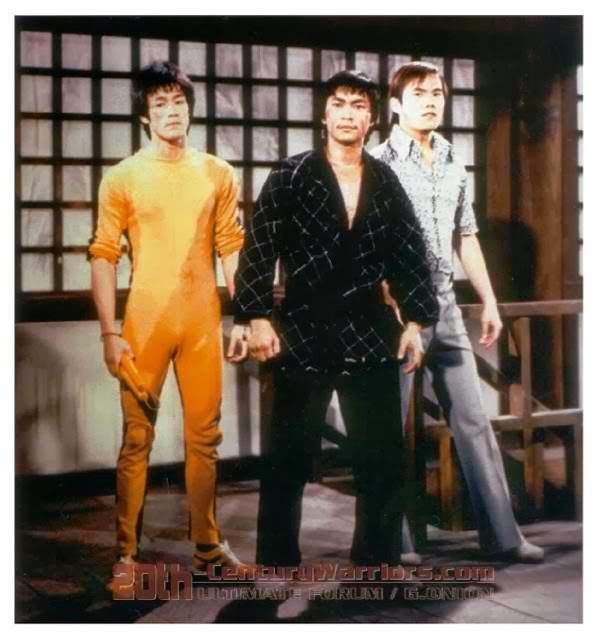 Now Bruce's plot outline was that three fighters – of varying attributes – had to fight there way up a pagoda, and at each floor, they had to test themselves by fighting different kung-fu practitioners. Also, along the way, the fighter who could adapt the best – obviously Bruce – would save the day. Granted, what or who Bruce was going to save is anyone’s’ guess really, because then came along ‘Enter the Dragon’ – a film he rushed off to make – thus inadvertently leaving this one unfinished and in a state of ambiguity. 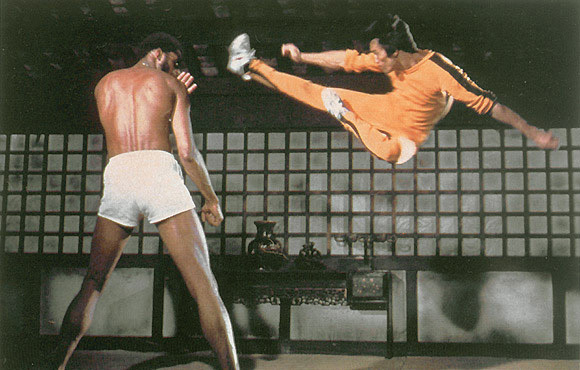 So where did that leave ‘Game of Death’ when Bruce died suddenly after ‘Enter the Dragon’. huh? Limbo I am afraid to say - that is until someone realized that there was some footage of Bruce that he had filmed, and then tried to cobble it all together into this ‘masterpiece’. Err - when I say 'masterpiece' - what I mean by this, is that it is a film that does not really have any sense of tonal aspiration. Granted, on the one hand, some of the actors are not that bad in it, and try their best to 'put on a show'. Whilst, on the other hand, the distasteful 'cash-in' on Bruce's good name, does leave a bitter taste in your mouth while you are watching it. Please note, I really wish that I could praise this film somehow - just so I can end this review on a more positive note. Oh! I suppose I can really! Colleen Camps breasts are perky, you get to see a glimpse of Sammo Hung, some of the fights are OK, and the theme tune composed by John (James Bond) Barry is nice as well. Perfect... just as Bruce was.